“Talking turkey” is an old idiom referring to a candid discussion. In present use the phrase denotes a matter of business, a factual and straightforward approach to problem solving. This contemporary definition works just fine, unless you are a fly fisherman. 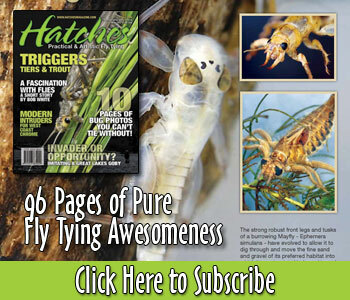 Here at Hatches, we’re always on the lookout for interesting fly patterns. Probably the single greatest resource we have at our disposal for finding them is the Fly Pattern Database (which has grown to over 10,000 fly patterns!). No where else on the web can one find a greater archive of fly patterns, and we would like to thank everyone who has contributed to it. To express our great appreciation, and to make sure “older” patterns aren’t forgotten, we have decided to highlight three fly patterns from the database each week. We’ll share the best of the best, from the past to the present. Have you ever been ambushed by an idea? Not a mere suggestion or nagging intuition, but a full force, frontal assault of the psyche. Somewhere in our move to Wyoming four years ago and while exploring the surrounding hills, I was smitten by the notion of dying fly tying materials with flower pigments. The relentless “what if” that plagues an otherwise sound mind propelled excursions to identify, collect, and extract pigments from wildflowers. It is hard to grasp the logic of such behavior as it may not exist; the idea just showed up one day and would not be persuaded to leave. There is nothing more fun in fly tying than putting a new twist on an old pattern. And that’s just what we have here, with a step-by-step tutorial by JohnTerje Refsahl of Norway on a Biot Body, CDC Comparadun. Al Caucci, Bob Nastasi, and maybe even Fran Betters, would be proud. The following is an excerpt from Barr Flies written by John Barr, fly tying photos by Charlie Craven (Stackpole Books, August 2007, 184 pages, 570 color photos, 22 illustrations) which is available at Fly Shops and booksellers everywhere.